As the Fine Jewelry Buyer at Net-A-Porter, this British beauty is, for lack of a better phrase, freaking nailing it (in part to green juice landing in London, no doubt). One needs to look no further than the perfectly curated fine jewelry collection on the site, made up of a fantastic mix of International designers, encompassing boldfaced names and up-and-comers, alike. Although she spends her days working alongside some of the most influential people in the industry (Natalie Massenet, anyone? ), we can always count on the the divine Mrs. Q. for tea time (no milk, please), chats on the latest trends, the best reccos for evenings out in the UK, and a hearty laugh. In short, we'll take one of everything, Soph, and thanks for reminding us that NAP delivers same day in NYC...as if Meaghan doesn't have enough of a shopping problem. — Sophie, on never working in another department. Ever. How long have you been a buyer at Net-a-Porter and what did you do before your current position? You have quite an important role. It feels like I started yesterday, but it’s been nearly three years. Maybe that’s a sign that I really do have the best job in the world! Prior to NET-A-PORTER, I was at Harrods for five years where I started out as a personal shopper and worked my way up to become a jewellery buyer. Congrats on your wedding! 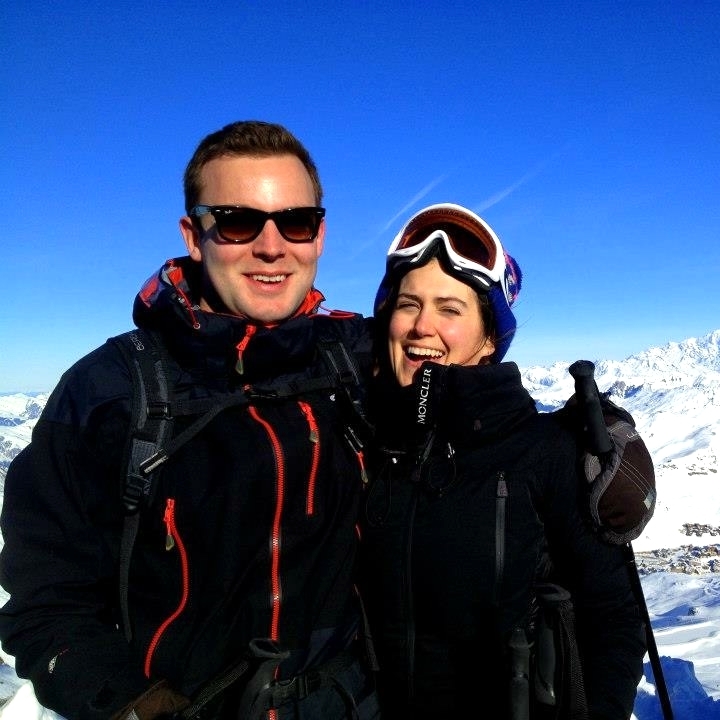 Tell us about your inspiration for sporting that amazing ear cuff (and the rest of your ensemble) on your big day?! Jewellery is obviously a major part of my life, so I had to have something sparkly and special for my big day. 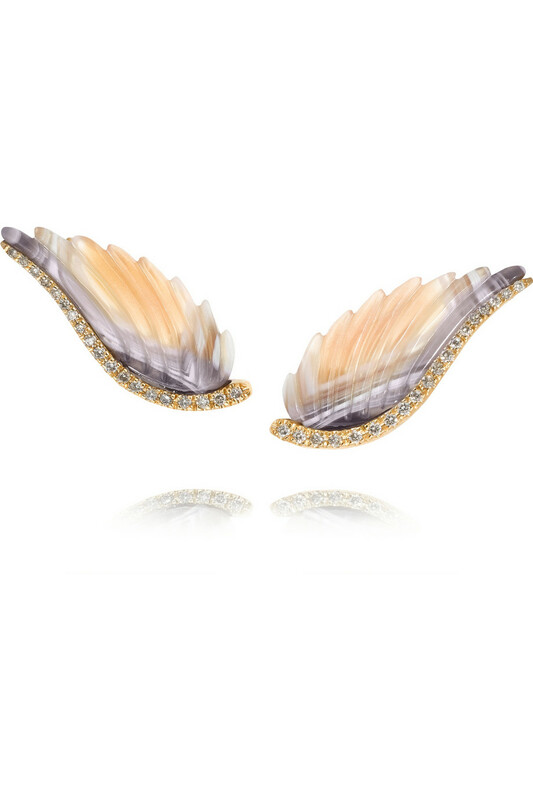 During my buy appointment with Ana Khouri, I fell in love with the earcuff and just knew it was the perfect piece. I was so grateful to Ana who made sure it fit on my tiny ear. Regarding the rest of my outfit, I wanted to keep everything simple. I wore a Lanvin Blanche dress in the most lovely brocade and cream paired with satin Valentino heels and four Jennifer Meyer bangles with small diamond details. Was wedding planning easier or harder having limitless outfit options at your disposal? I travel so much for work that I had to make things easy for myself. I called in my favourite styles to the office to try on for my team and mother who helped me decide. I didn’t have time to do numerous fittings so I ended up choosing my amazing dress from NET-A-PORTER. 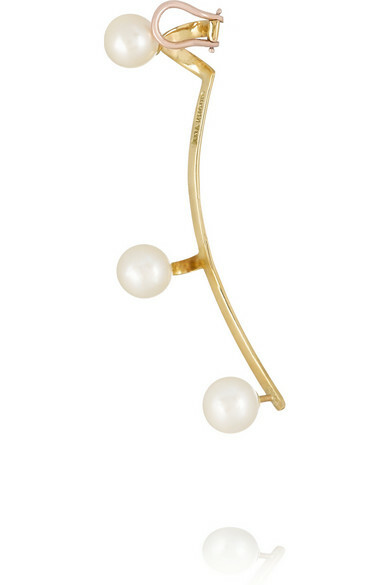 What are your favourite 5 picks for fine jewellery available on NAP right now? 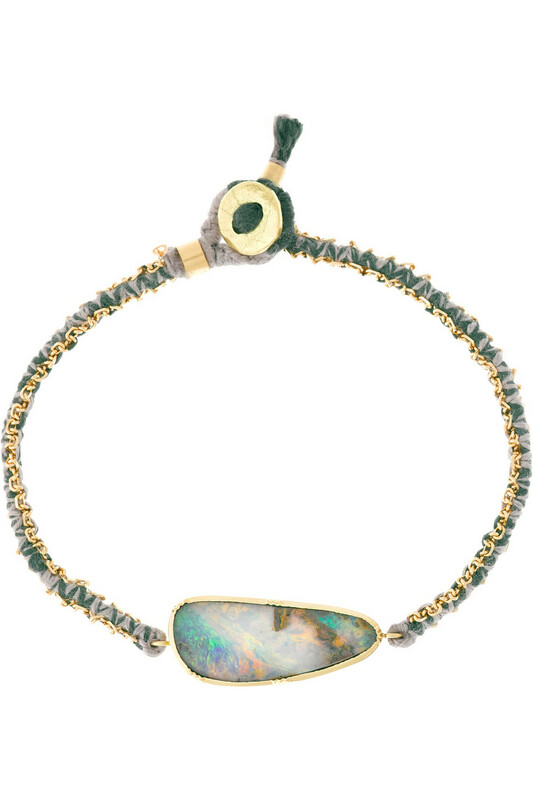 Brooke Gregson bracelet – but I’d need at least 3, so perfect for summer! Name a new (to NAP) fine Jewellery designer that our readers should know about. I am coveting Wendy Nichol right now. Her pieces are amazing, so subtle and yet so cool in an off duty model way. I am slowly filling my ear up with more piercings so I can wear all of her looks together. I also love Elena Votsi. Her pieces are the perfect way to rock a statement piece. Of course DIAMONDS – they’re a girl’s best friend. I also love watermelon Tourmaline. What’s your favourite piece that you’ve recently purchased? 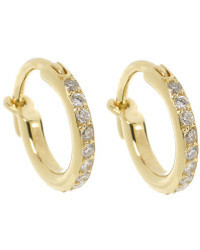 I just purchased a gorgeous yet simple Ileana Makri huggy hoop in yellow gold with pave detail. It pairs so well with everyday looks. What is the most sentimental piece of jewellery that you own and what's the backstory? I would have to say it’s my Signet ring which is featured in nearly every picture of my hand on Instagram. It has the Kerr family crest which is my maiden name, as well as a sun and the motto “Sero sed serio” which means ‘Late but in earnest’ – although I am SO punctual. It was given to me for my 21st birthday by my grandparents who have sadly since passed away and I will never take it off. My father and uncles as well as my siblings have one. Why do you think people are becoming so comfortable purchasing fine jewellery online? This is definitely a new phenomenon. Fine jewellery is certainly growing in popularity for us. Women used to save their fine jewellery for special occasions, whereas they now style their pieces with everyday looks. I think the fact that our customers can shop with us 24/7 all year round from any device, anywhere in the world makes shopping with us incredibly convenient. We have an incredible customer service team as well as personal shoppers who are on hand at all times to answer any customer questions. We also have a fantastic team of fashion advisors who have a wealth of knowledge on each piece of fine jewellery that we stock. Each item is photographed by our in-house photographers in London and in New York, and they style each piece by itself and then as part of a full outfit which really helps customers understand how they can style the item. We also offer detailed shots with zoom functionality for those who want a closer look. And we measure every product so they feel as if they have tried on the piece. We also offer brand details on our product pages, so customers can connect with the story behind the designer. This ensures the romance of buying something isn’t lost online. Next time FFR is in London, where do we eat? - I love the Dandelyan bar at the Mondrian in London. After that I usually take a stroll along the river. It’s also a great place to stop into after a trip to the Tate Modern. Scale of 1-10…how happy are you to be able to buy a green juice in Europe now? If I could say a million then I would. It is so amazing to finally have juice shops on every corner. My two favourites are Roots & Bulbs and The Juice Well. There is also an amazing one in Paris by Place de Victoires called Juice it. I have such a busy schedule that I often take Borris Bike to work or on weekends. It’s a great way to exercise and enjoy all of the gorgeous views. Mumford & Sons, Sam Smith, Florence & the Machine, Rudimental, and Taylor Swift, of course. Jamie Dornan, and not because of the Fifth Shades phenomenon. And I also am a bit obsessed with Daria. I love Diptyque Rose. It’s natural, light and clean. If you could buy for any other department, what would it be and why? I have a bit of a shoe obsession like any girl, so probably the footwear department although I don’t know how I could ever leave the world of fine jewellery! What are your top 3 tourist destinations in London? Buckingham palace (in the summer you can tour some of the rooms which is amazing), National Gallery and Regent’s Park. Thank you, Thank you, Soph!